Based in Tampa, Florida, WellCare Health Plans, Inc. is a Fortune 500 company. Partnering with leading health care providers and governments, WellCare delivers Medicaid, Medicare Advantage and Medicare Prescription Drug Plans to approximately 3.7 million members nationwide. In a health care industry that is continuously evolving, new technologies have revolutionized communication methods not only for customers, but also third-party providers. These changes present a massive challenge to those who manage the information technology of these large enterprises. 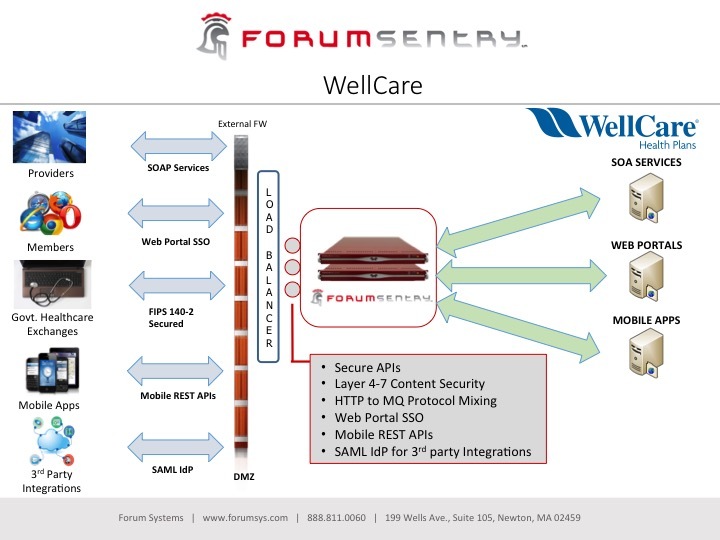 By adopting Forum Sentry as its solution, WellCare has been able to give members, internal customers and third-party partners real-time access to critical information; ensure security of that data; and adhere to the exacting regulations of the Health Insurance Portability and Accountability Act (HIPAA). Secured critical data to prevent it from being compromised. Eliminated the need to manually code a solution. Deployed a solution with minimal network disruption.